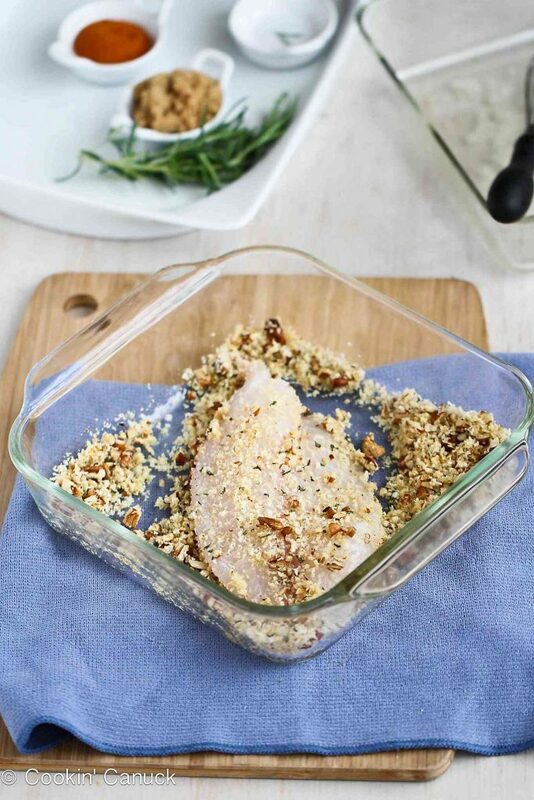 This baked tilapia recipe is directly inspired by one of my favorite Manhattan meals. It’s a testament to how my brain works that 95% of my memories of living in New York City revolve around food. One of our favorite haunts was Union Square. From the Smiling Pumpkin Ale at Heartland Brewery to the abundance of fresh, local vegetables at the Greenmarket, it had a “food lovers” vibe about it. Just a couple of skips away from the square is the Union Square Cafe, a New York City institution of the restaurant scene. My husband and I enjoyed a couple of wonderful meals at the Union Square Cafe, but the real reason I’m telling you all of this is to get to one of the most modest dishes…well, snacks…served at the restaurant. The bar nuts. They narrowly edge out my addictive Curry Spiced Nuts. These little nuggets are more flavorful than any roasted nuts I’ve ever come across, and they have become a family favorite. Tossed with olive oil, fresh rosemary, brown or coconut palm sugar and cayenne, these nuts are the perfect partner for a martini or a beer. When I pulled some tilapia fillets out of the fridge the other day, I was poised to make my usual Baked Tilapia with Pesto recipe (a dish that surprisingly makes my kids cheer when I tell them what’s for dinner). However, those bar nuts snuck into my mind and it struck me that those same flavors that make the nuts so addictive would work beautifully as a crust for the tilapia. This was a hit with all three of my boys, big and little. And really, you can’t beat a flavorful seafood recipes that offers a mere 222 calories per serving, and a good dose of healthy fats. It may not be the same as a trip back to New York City, but it certainly makes for a satisfying meal. This healthy baked tilapia recipe comes together in two easy parts. First, the pecans, panko breadcrumbs, rosemary, coconut palm sugar (or brown sugar), salt, cayenne pepper and olive oil are tossed together and toasted in the oven. 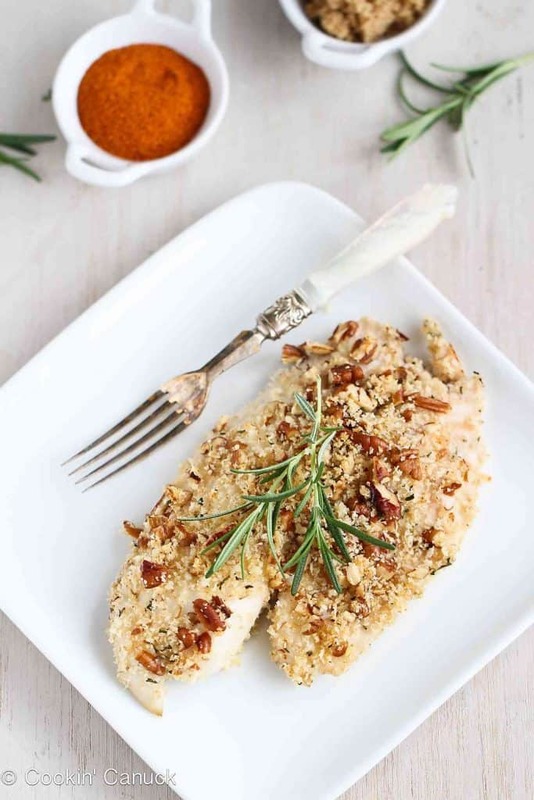 Next, the tilapia fillets are dipped into egg white, then crusted with the pecan rosemary mixture and baked until the tilapia is just cooked through. Serve this up with a farro salad or toasted brown rice with a side steamed veggies. 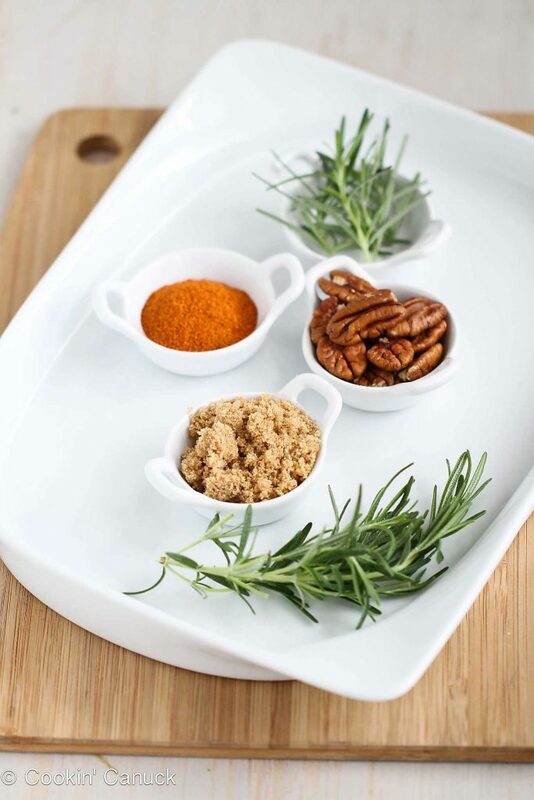 In a small baking dish, stir together pecans, breadcrumbs, rosemary, coconut palm sugar, salt and cayenne pepper. Add the olive oil and toss to coat the pecan mixture. Bake until the pecan mixture is light golden brown, 7 to 8 minutes. Increase the heat to 400 degrees F. Coat a large glass baking dish with cooking spray. In a shallow dish, whisk the egg white. Working with one tilapia at a time, dip the fish in the egg white and then the pecan mixture, lightly coating each side. Place the fillets in the prepared baking dish. Press the remaining pecan mixture into the top of the tilapia fillets. Bake until the tilapia is just cooked through, about 10 minutes. Serve. 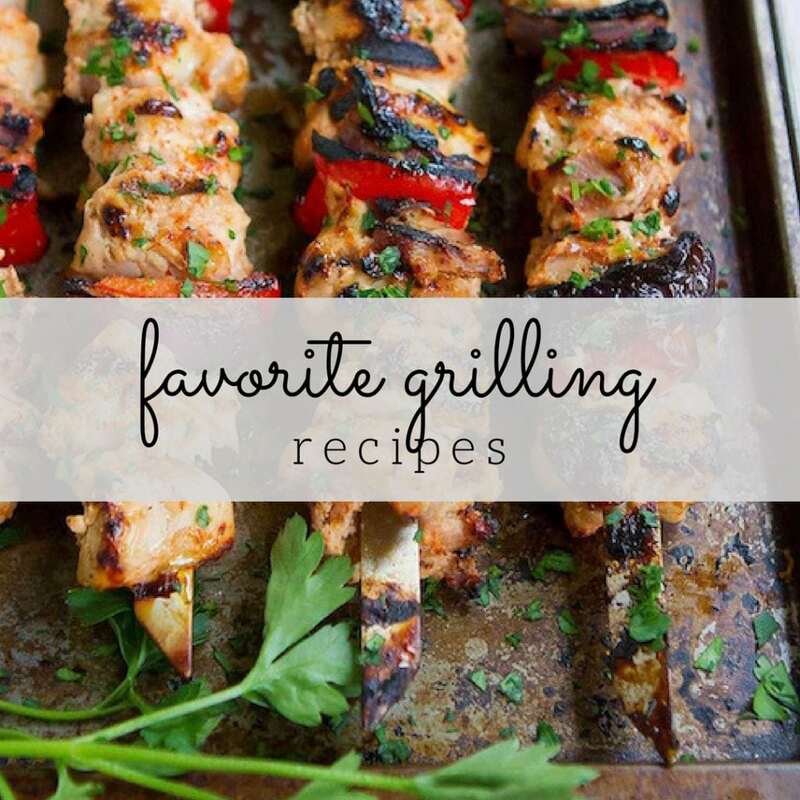 This recipe was originally posted on March 13, 2013, and has been updated. This sounds insanely delicious!! Had no idea you lived in NYC!!!! Thanks, Liz. Yes, we lived in NYC for about 3 years…many years ago. I loved every minute of it! I love the crust on this. Tilapia is a go-to for us so I love finding new exciting ways to prepare it! Thanks, Cassie. We eat a lot of tilapia, too, and I’m happy to have a new recipe in my arsenal. Thanks, Ali. It reminds me of those bar nuts, which I just can’t resist. absolutely perfect Dara – fish, crunchy topping, yet light! Thanks, Deb. It was a hit with the whole family. I’m always on the hunt for new fish recipes, and this baked tilapia looks so fresh and flavorful! Can’t wait to try it! Thanks, Kelly. I hope you have a chance to try it. I LOVE this idea! We’re trying to get into more fish recipes around here so this is definitely going on the list! Thanks, Stephanie. We’re trying to eat fish more regularly, too. It’s such a great lean protein option. Baking is one of my favorite way to prepare fish and the topping sounds great. Thank you! We always choose to bake or broil, too. Love your tasty twist on tilapia… It looks so delicious and fresh, not to mention using a very inexpensive fish! Thanks for sharing. These are all my favorite flavors, Dara! I love pecans and rosemary. I can’t tell you how many times I’ve seen those Union Square nuts referenced! They sound alot like a favorite recipe I always make during the holidays, passed down from a work friend. I LOVE that you transferred the flavors to this gorgeous dish using fish! I’ve had those nuts and they deserve all the hype they get. I love this healthy dinner adaptation. I don’t eat a lot of fish (though I should) and I can’t help but think this would be great on some chicken cutlets! 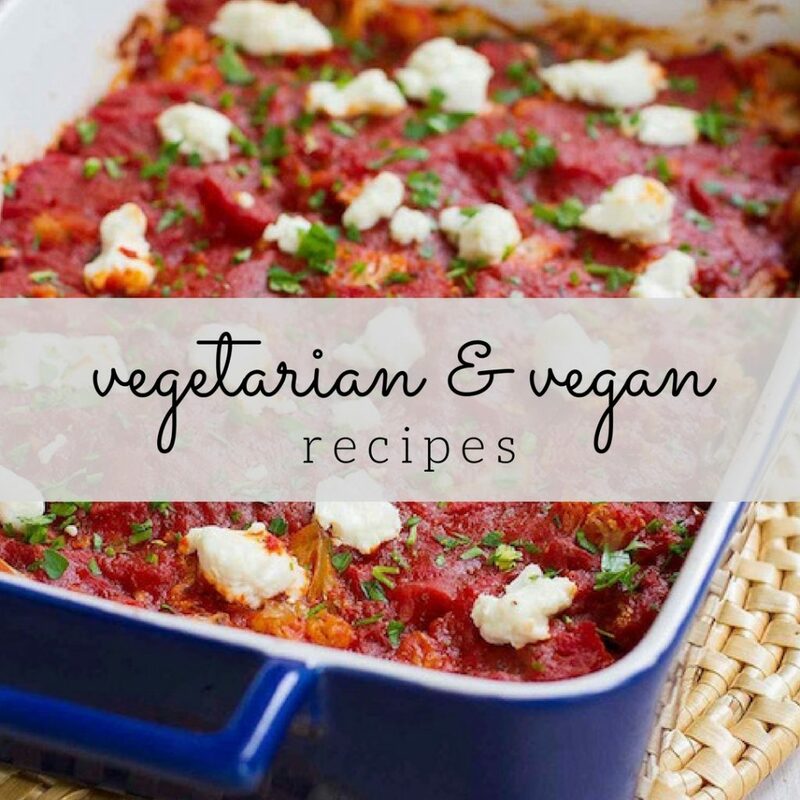 Brilliant idea to combine to well-loved tastes into one meal, Dara! My family loves tilapia, too, though I have to laugh–my spouse was reading some article that mentioned the fun thing about being a dad was “being able to eat fish sticks again”, so guess what was in the oven when I returned from a weekend-long sled hockey tournament in Grand Rapids? Fish sticks! Apparently we like fish in a lot of ways, to include the box of fish sticks as well as the nut-crusted tilapia. We love Tilapia in this house. Truth be told we should be making more than we do. And because I always have rosemary and pecans stocked it`s safe to say we will be soon. This recipe. Love it! Tasty, tasty fish Dara. I love the nuttiness. Dara: What a beautiful dish presentation! Tilapia is one of my favorite fish because its mild taste and silky texture. 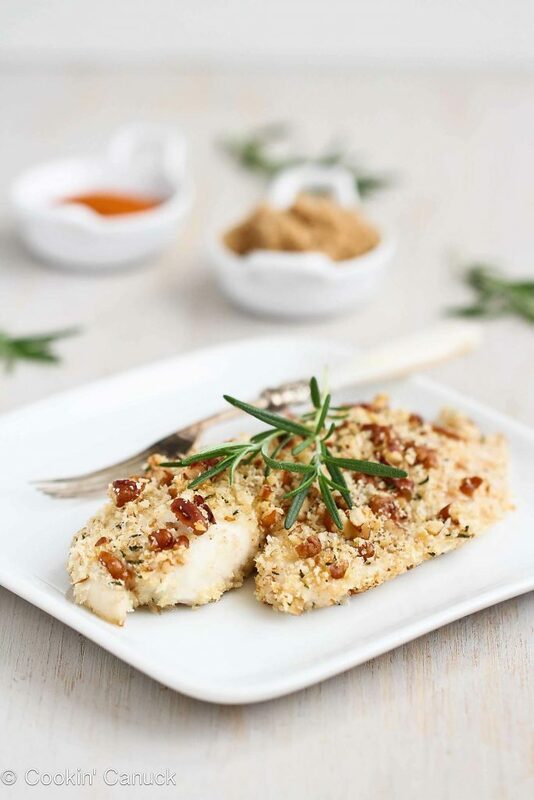 Crusted with pecans and rosemary, it’s even better! Great recipe! I hade no idea you live in NYC. How fun! This looks so good and healthy! I wish we would of had this for dinner! 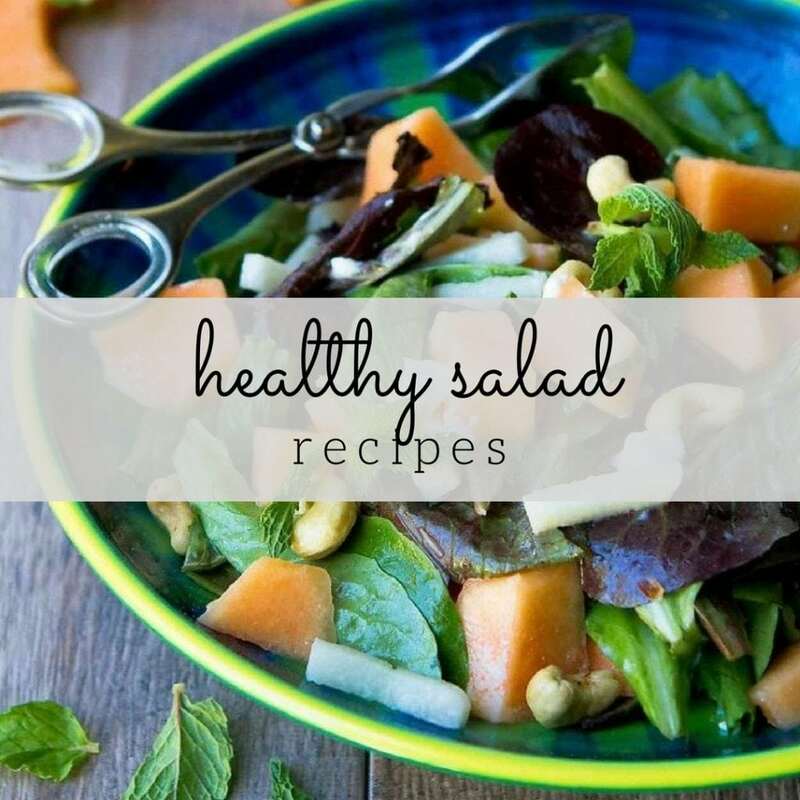 Love this flavorful, healthy meal! I’ve been looking for different way to prepare tilapia, this is going on the menu soon! I am going to try this on salmon – I get tired of the same ways of serving it as a heart healthy dish for The Hubs. Thanks for inspring me once again. I was just thinking today that I don’t eat nearly enough fish lately. This sounds so good – a great way to serve tilapia! This looks wonderful! I love encrusting tilapia with nuts. I’ve never thought of using fresh rosemary and brown sugar. I’ll have to try this recipe. Thanks! I saved this recipe a long time ago and finally made it for my family last weekend. Tilapia has never been a favorite here because my kids always complain that it’s too dry, but this recipe completely changed their minds. The toasted pecan crust was so good and I could have made a meal out of them!